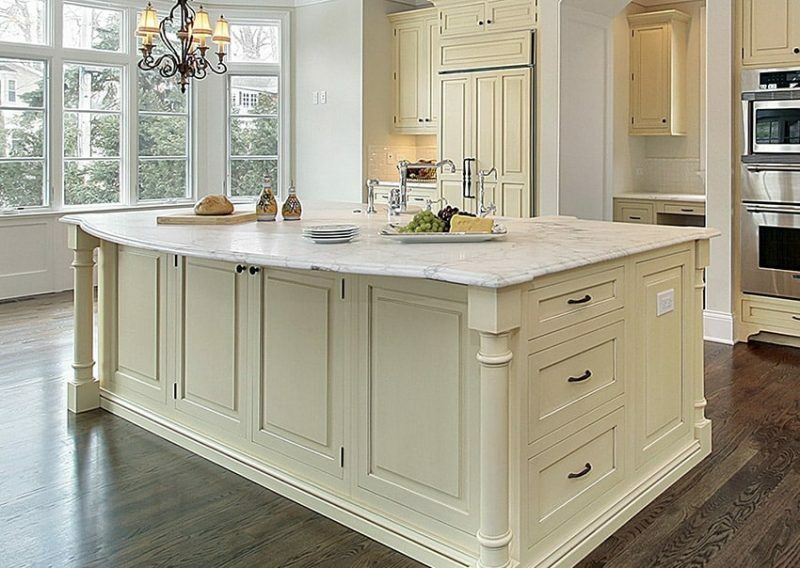 Marble kitchen countertops look amazing and can bring a sense of luxury and elegance to your space. Below you’ll find out some of the top pro’s and con’s of using this gorgeous natural stone in your kitchen. Marble is one of the most classically elegant and beautiful materials out there. The very word “marble” summons up images of stylish luxury. Homeowners love the look of marble and its timeless elegance. 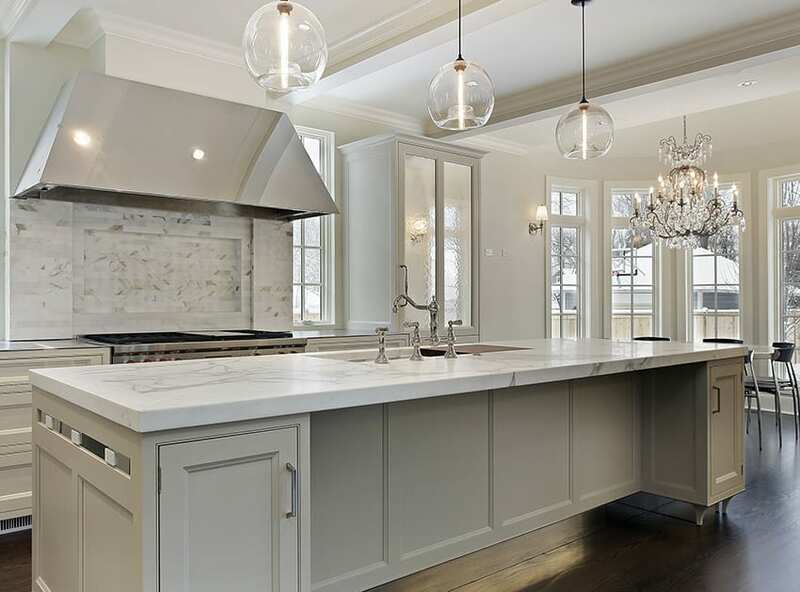 Not only can marble counters increase your home’s resale value it brings a lot of satisfaction when preparing foods and spending time in the space. The great news is even in spite of its great looks, marble can be less expensive to install than other types of natural stone such as quartz or granite. Marble comes in a variety of color combinations and can fit in almost any room design. There is a large range of natural colors to choose from. 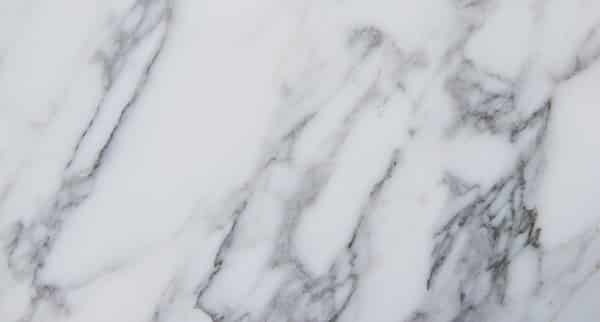 Marble comes in hues of white, grey and black as well as yellow, green and pink. Marble is formed when limestone or dolomite rock is subjected to extreme heat and pressure. This is also when the veins in marble are formed. The distinctive veining of marble gives each slab a unique look. No two slabs of marble are the same so you can be sure that your countertop is unique. It is a soft stone, this makes a slab of marble easier to work with than any other slab of stone. It can be molded and shaped. Marble can come in smaller sizes then other stone materials. Marble can come in tiles rather than slabs. Instead of one continuous stone slab countertop, you can have several marble tiles make up your countertop. There are a variety of marble kitchen countertops with different finishes to choose from, which can be made to work with almost any room design. If you choose a honed or matte marble finish, you get a smooth, honed surface in muted colors. Scratches don’t show up as much in a honed or matte marble finish. A leather finish is usually used with dark marbles and gives off a soft sheen. Because it is textured, it hides scratches and other imperfections. Marble is a more durable material then synthetic materials. It is largely resistant to cracks, scratches and burns – especially if you take care of it properly. It is heat resistant – to a point. If you are using it for your kitchen, don’t put a hot pot or pan from the stove directly on your marble countertop. Marble is a naturally cool material so a marble countertop will stay cool naturally. A marble countertop is easy to clean. Spills are easily wiped up with a cloth. For daily cleaning, all you need to do is take a mild soap and warm water mixture and a sponge or non-abrasive towel and just sweep over the countertop. If you choose a polish finished for your marble countertop, the marble will be buffed resulting in a high-gloss surface that really brings out the details of your marble slabs color and veining. While there are many benefits such as beauty and value added, there are also some things that need to be considered when using this natural stone. Marble is not a budget material. The price range can fall between $125 and $250 per square foot of marble. It is however, one of the least expensive of the natural stone countertop materials. Since it is a soft stone, it is prone to stains and scratches over time. You will want to invest in treated or sealed marble to get around this. Despite being a “soft” stone, marble is an unforgiving surface to drop a plate or dish onto. A dropped dish on a marble surface is almost always a shattered dish. As a soft stone, marble can be chipped or develop cracks if something heavy is dropped onto it. Marble countertops are heavy and difficult to handle. 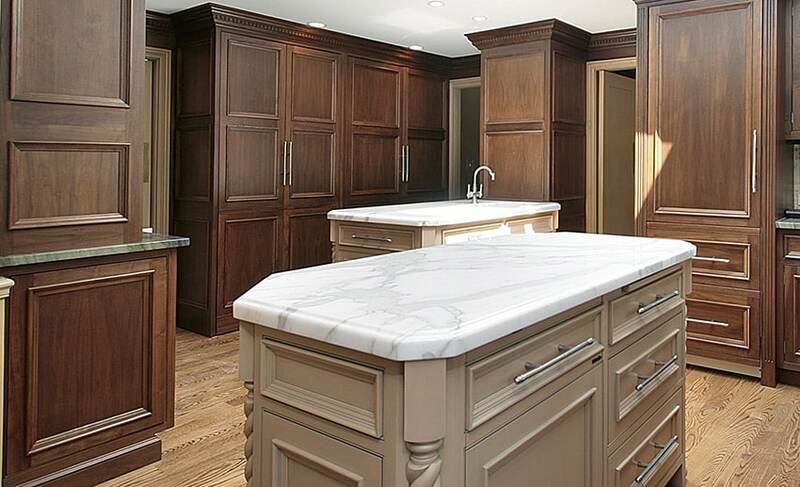 If you decide to have a marble countertop, while you can choose the particular slabs you want installed, you’re not going to be able to install them yourself but will need to seek the services of a professional. Marble can also be difficult to transport so there could be delivery fees and charges included in getting your chosen marble slab to your home. Marble is composed of calcium carbonate which is sensitive to acidic solutions. If you’re using marble in your kitchen countertops, you’re going to need to make sure that you minimize its contact with acidic foods. Acidic substances – such as wine, lemon and other citrus juices, vinegar – if not cleaned up right away can etch the surface of your marble countertop. Honing the surface of marble makes it more porous which can make it more prone to staining. Polished finish marble is susceptible to etching from acidic foods or even from strong household cleansers. It can be high maintenance. Marble has a naturally porous surface which means that it absorbs liquid quickly and this can make it prone to staining. If you spill oil or wine or liquid makeup on a marble countertop and don’t wipe it up promptly, it can penetrate marble’s surface and be very difficult to remove. Most marble countertops are made of treated marble that has a seal or protective topcoat that can prevent staining. You will need to have your marble countertop resealed on a regular basis – at least once a year. DIY Safety Protocal – Dust that is produced when dry-cutting marble could cause illnesses/disease. Vendors take very high precaution when cutting marble. Typically most manufactures will wet-cut the marble to avoid creating harmful dust particles. There are legal limits of “marble exposure” that a person can be exposed to in a day set by OSHA as well as NIOSH to keep workers safe. Anyone planning a DIY marble project should take that into consideration and take necessary precautions or have a professional with safety procedures already in place assist with the project. Depending on the type and of marble you choose the price ranges from between $125 and $250 per square foot. Marble is relatively comparable in price to granite which usually sells at retail outlets in a range from $100 to $225 per square foot. Different styles of honing to remove some of the polish can cost extra as well as the number of cut-outs required for your specific application. Read more about the cost of marble countertops on this page. As you can see there are a variety of reasons to choose marble countertops for your kitchen or bathroom vanities. However, with the beauty of this stone comes some precautions. With some extra care marble counters can be a valuable addition to your next remodeling project and help create a design you’ll love.